I am delighted to introduce authonomy friend, Rosalind Minett today. I have always admired her dogged perseverance with her writings; she is an example to us all. Thank you, Jane, for inviting me to be a guest on your blog. Nowadays I think of myself as a writer. It’s how I spend my time, reviewing, blogging, writing and above all, re-writing. I would really have liked to be a character actor. At university level, I wanted to read English Literature but another career as a chartered psychologist intervened. It has influenced my writing as I’m told my strength is being able to get into peoples’ heads. I worked with adults and children over their learning, behaviour, and/or understanding, their parenting and their career aspirations. I was frequently in the Crown Courts, work that involved direct contact for psychological assessment (sometimes in odd situations), research, copious reading of documents, writing of lengthy reports and finally, appearance in the witness box (not to be recommended for those of nervous disposition). Altogether, a rich experience of a multitude of characters, from barristers to rogues to the vulnerable in distress. It’s true that as a reader, I can’t really enjoy a book unless the characters are fully evolved. Despite the wonderful plots of Jeffrey Archer and Dan Brown, their cardboard characters leave me unsatisfied and uncommitted by the novels. Because I prefer to read and write character-driven fiction, my writing blog is called Characterful Writer. Although the posts may include various topics, such as about other art forms, I always have character development in mind. Whether writing fiction or non-fiction, I like to be entertaining and thought-provoking, to leave readers questioning their previous understandings. I particularly enjoy writing the sub-text of what people say or do. It’s quite difficult to let the reader ‘notice’ subtle clues, but it’s a challenge. My middle son always used to say I was ‘smiling behind my (unsmiling) mouth’, i.e. that I had a sub-text. If anything does characterise my writing, I suppose it is that. With my novels, I research any factual sections in a library or online. E.g. How many years might it take a scientific officer to become a senior scientific officer. The first one to see the light of day, very soon now, will be A Relative Invasion, a story about boyhood rivalry, set in WW2. The second is about adult male twins caught up in a domestic mystery (The Parody). 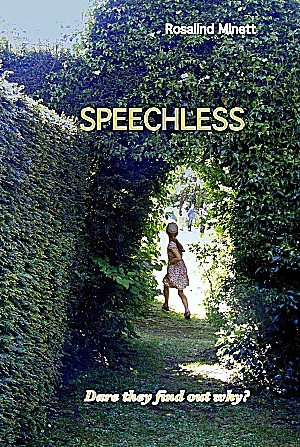 The third is about a favoured family whose child inexplicably stops talking (Speechless). Although it is my three novels that I am keen to get fledged, I have published a collection of short stories as my way of dipping my toe in the writerly waters. Me-Time Tales: Tea-breaks for mature women and curious men, ironic short stories with a dark edge. All kinds of women unlocked and revealing their different situations and dilemmas. Middle aged Mrs W. makes a strange theft in a well-woman clinic, teenaged tattooed Jess risks losing a date because of her insistence on the shape of his legs, Elaine faces a moral dilemma but is no push-over. Me-time Tales were written at different times and in different places over a long period. Three years ago I saw that I could group certain of my short stories under one heading to make a collection. I thought about a title that encapsulated something that the stories had in common. I decided this common factor was self-absorption and ‘Me-Time’ popped into my head – mainly because of my irritation over seeing this ‘need’ perpetrated everywhere. The book became Me-Time Tales, and I wrote a few more stories with that theme of self-absorption in mind to make the collection of a suitable size. The characters took over straight away and they determine its content. They run well beyond their original stories, I’d say. I didn’t want the usual style of blog, so instead of an author photo I have an avatar. This refers cheekily to my interest in Art (forgive me Picasso) and also to my serious versus quirky self. The best piece of advice I read before publication was this: After finishing writing the book, the hard work begins. As others have found, managing this blogging seriously cuts into writing time. This entry was posted in Authors and tagged Authonomy, blogging, character-driven fiction, Crown Courts, Dan Brown, Jeffrey Archer, Rosalind Minett. Bookmark the permalink. I can’t comment. I am doggedly perservering with the second half of a story.